Rural Water District No. 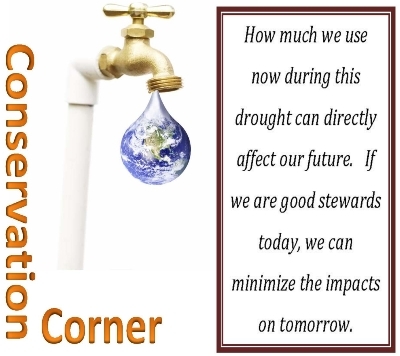 2 Is asking for your water conservation tips. Keep a pitcher of water in the refrigerator rather than running the tap until the water gets cold. Fixing that leaky toilet can save as much as 500 gallons per day, or as much as $1,000 per year. Check toilets for leaks by putting a few drops of food coloring in your tank. If the color begins to appear in the bowl without flushing, you have a leak. Repair dripping faucets by replacing washers. One drop per second can add up to 2,700 gallons per year. Don’t let the water run while brushing teeth, shampooing your hair or shaving. On average, you will save more than four gallons of water. Take shorter showers. Install low flow shower heads. A quick shower rather than a bath can save an average of 20 gallons of water. EPA recommends taking three to five minute showers. When running a bath, plug the tub before turning the water on, and then adjust the temperature as the tub fills up. Keep a bucket in the shower to catch water as it warms up or runs. Use this water to water plants. Use both sides of the sink when washing dishes: one side to wash and the other to rinse. Don’t wash the dishes with the water running. Collect the water you use from rinsing fruits and vegetables, and then reuse it to water household plants. Garbage disposals use approximately 11.5 gallons of water per day. Try composting organic wastes instead. Install flow restrictors in faucets. When cleaning a fish tank, use the drained water on plants. The water is rich in nitrogen and phosphorus, a healthy treat for plants. Never pour water down the drain when there may be another use for it such as watering a plant or cleaning around your home. Use mulch around trees to slow evaporation. Water lawns and plants early in the morning or during the evening when there’s less evaporation. Water your lawn only when it needs it and adjust sprinklers so you’re not watering the sidewalk or street. Also, aerated lawns absorb water better. Direct downspouts and other runoff toward shrubs, trees and gardens. Use sprinklers that deliver big drops close to the ground. Smaller water drops and mist often evaporate before they hit the ground. Use soaker hoses to water plants more efficiently. Set a kitchen timer when watering your lawn or garden to remind you when to stop. A running hose can discharge up to 10 gallons or more a minute. Use drip irrigation for shrubs and trees to apply water directly to the roots where it is needed. Encourage your school system and local government to develop and promote a water conservation program among children and adults. By following these simple suggestions, homeowners can conserve hundreds of gallons of water, saving money for themselves and their communities, helping water supplies withstand drought and lowering energy costs.